Save $10 OFF $75+ at Home Bistro during the month of July! Use promo code SAVETEN for $10 Off All Orders Over $75! 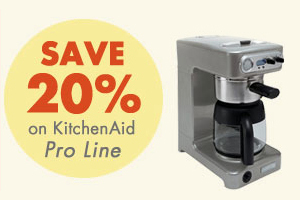 This Just In - Save 20% on KitchenAid Pro Line at Cooking.com! Here's another one I just found. If you haven't visited HomeBistro.com yet, check them out and use the code below. As someone who spends lots of time in the kitchen, I'm always looking for a bargain on kitchen gear. I come across some good deals, coupon codes, promotional codes, etc., from time to time and when I do I'll post them under the Shopping Alert category.